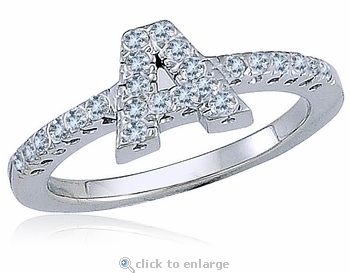 The Capital Letter Initial Pave Set Cubic Zirconia Ring offers a custom personalized look in a sparkling design. 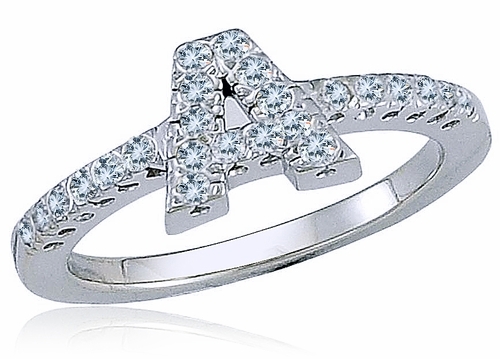 Each available capital letter is beautifully accented with pave set cubic zirconia rounds that are hand cut and hand polished to exact diamond specifications. Choose any capital letter from A to Z and metal option in your choice of 14k yellow gold, 14k white gold, 18k yellow gold, 18k white gold and luxurious platinum. Whole and half finger sizes are available in the pull down menu and additional finger sizes can be ordered, please call for details. A similar ring is offered without cubic zirconia stones set on the band, please see item R2008. The option for different stones colors is also available via custom order. For further assistance, please contact us directly at 1-866-942-6663 or visit us via live chat and speak with a knowledgeable representative.